Cenglow Swift is the reason we started breeding Abyssinian cats. He is the most exquisite tawny Abyssinian cat who in 2006 did very well on the ACT and NSW show benches. In the New South Wales Cat Fanciers' Association 2006 Awards he achieved 5th Group 3 Neuter Cat. 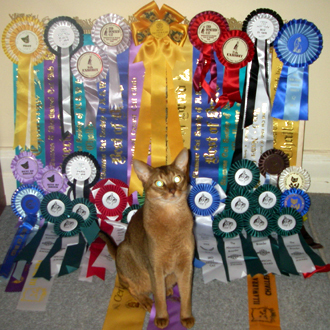 The Abyssinian Breeder Awards cover cats both in Australia and New Zealand; in the 2006 awards Swift was Best Desexed Abyssinian Cat and 10th Exhibit. Also in 2006 the Abyssinian Cat Club of Australasia awarded him Best Desexed Abyssinian Cat and 7th Exhibit. During 2007 Swift will be working towards his NSW Gold title and the Coordinating Cat Council of Australia Champion title. At the end of 2006 Swift's official title was: NSW Silver Double Grand Champion Cenglow Swift. Swift gained enough points in the first two shows he attended in 2007 to become a CCCA Champion & Gold Double Grand Champion. At the 2007 Sydney Royal Easter Show, he was the Group 3 reserve neuter cat in Ring 2. In 2007, Swift also gained his Champion and Grand Champion titles in ACT under Capital Cats Incorporated. Swift has now been retired from showing and his official title is Co-ordinating Cat Council of Australia Champion, NSW Gold Double Grand Champion and ACT Grand Champion Cenglow Swift.